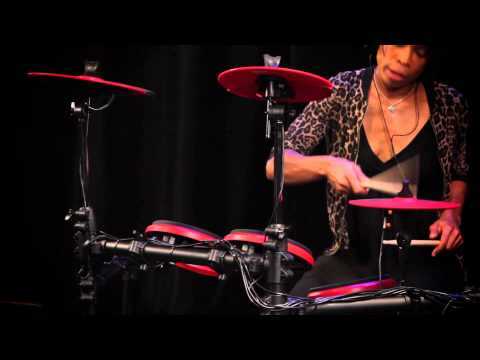 Introducing the brand new DD1 PLUS Electronic Drum Kit from ddrum. Now with Dual Zone Snare and Chokeable Cymbals. More sounds, User Kits and Songs than ever before! Also includes Micro USB.Finish: Black With Red AppointmentsKit Configuration: Ride and Crash Cymbal Pads With Choke Feature High Hat Pad w/Controller(3) Single Zone Pads, (1) dual zone snare pad .Bass Drum Pad With Stand Bass drum pedal includedSpecs (Other): DDRUM Sound Module with Aux InIncludes Rack SystemCable HarnessDual Line Out (9) InputsMidi OutReverb, Gain, 35 Stock Kits 335 Total sounds 60Play along songs 24 Pre set kits 11 user kits. DD1 plus rack is rock solid with high grade components.Has (9) inputs, 1/4", midi out, aux in/out, (35) on board kits, gain and reverb control, high hat controller, and bass drum pedal included. Includes the cable harness as well. Retail ready, and the red/black look of the kit helps you sell it. It visually POPS on the floor.Perfect for the smaller church market, or anyone who needs a good quality entry elec. kit. Do you own DDRUM DD1 Plus Drum set or have you had a chance to try it?